This week’s guest is the author of a book about tennis and aging, Richard’s most and least favorite things respectively. The former editor of the New York Times Magazine, Gerald Marzorati decided at age 54 to devote himself to becoming a competitive tennis player, virtually from scratch. 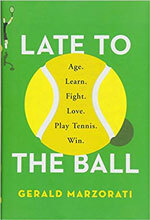 He details his efforts in his engaging memoir, Late to the Ball: Age. Learn. Fight. Love. Play Tennis. Win. In Late to the Ball Mazorati writes vividly about the difficulties, frustrations, and the triumphs of his becoming a seriously good tennis player. He takes on his quest with vigor and absolute determination to see it through, providing a rich, vicarious experience involving the science of aging, his existential battle with time, and the beautiful, mysterious game of tennis. Late to the Ball is also captivating evidence that the rest of the Baby Boomer generation, now between middle age and old age, can find their own quest and do the same.